A PONTELAND supermarket worker who hit the fund-raising trail in the countryside has received some extra support from her employer. Melanie Williams, a member of staff at the Sainsbury's store in Bell Villas, walked a gruelling ten miles from Cawfields to Housesteads Fort on Hadrian's Wall in under six hours along with five family members and friends. 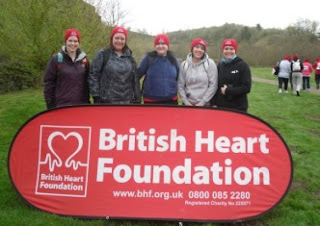 She raised £250 for the British Heart Foundation and a further £250 has been donated as she has been selected to receive funding from Sainsbury's Local Heroes matched giving scheme. Store Manager Jason Harmer said: "We are very proud to have colleagues that are so dedicated to helping out in the local community. "Melanie is an inspiration to us all." The Sainsbury's Local Heroes scheme recognises colleagues who dedicate their spare time to charity work. It has supported more than 10,000 applications, with almost £750,000 in additional donations.